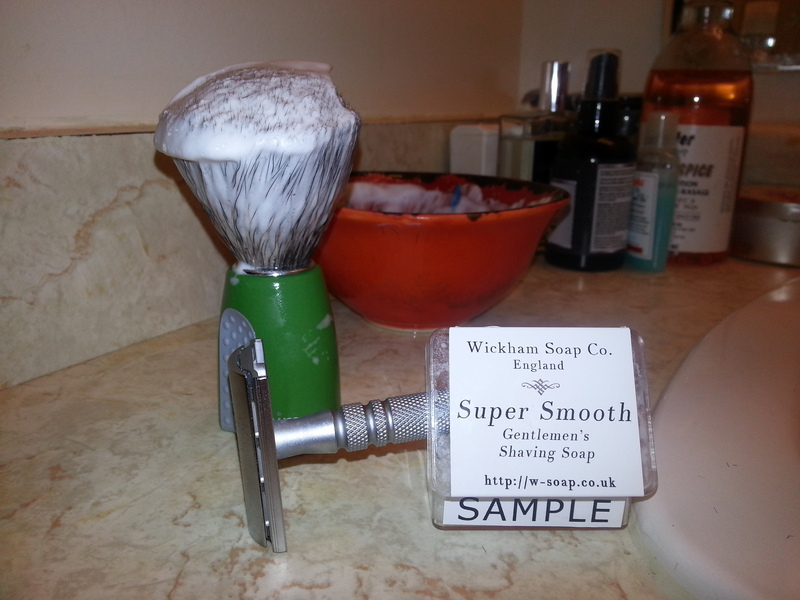 Offering up a brand new product out of England, we have Wickham Soap Company for the next review. The sample I recieved came in a little box, the product filling the box one of the softest soaps that I’ve come across. Probably still a bit too firm to truly be considered a cream. “Super Smooth” indeed. Thus, it was easy enough to scoop out a little bit from the box to test it out. I was quite pleased with the results. It was very forgiving for the amount of water needed; while it definitely needed a bit more than a splash, it would have been difficult to over-water it, as long as you give it enough elbow grease. A very wide “sweet spot” for good performance before it starts thinning out appreciably. Great glide, great protective lather, great performance really, with some really solid lather stability to boot. And it ended up leaving my face feeling rather pleasantly moisturized after the fact as well. The scent is described as being “An uplifting scent that has top notes of a citrus lemon nature, while the mid and base notes are that of vanilla and caramel.” All in all, I’d say that sounds rather accurate; I found it rather pleasant. The strength could have been better, once lathered and applied I’d say it is a fair bit shy of my ideal strength, although still reasonably noticeable, and with a relatively slow rate of fading. Overall, I’d say this is an easy 9/10. Cost: The sample shown was provided by the manufacturer for the purposes of this review. You can get your own 25g samples for £3.95, of a full 160g tub for £14.50. I liked the Wickham Soap Company Shaving Soap as well and I had to honor to do a review of the Bay Rum scent. Always good to see people agreeing with me! And yeah, not the cheapest, but the quality’s high. I’d almost always rather that than a poorly made cheap product.